This I found on my front door tonight. 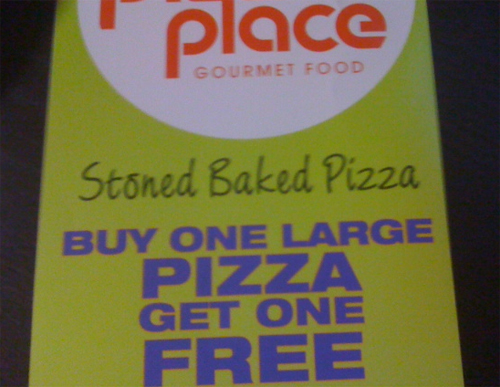 Stoned Baked Pizza? The difference between that and Stone Baked Pizza is slight but also, you know, gigantic. You’d think they’d know that verbiage like that doesn’t sell pizza in a decidedly non-college neighborhood like Brentwood, but then again, they were probably stoned and baked when they approved the copy. And I assume the “buy one, get one free” offer only holds true if the delivery boy manages to find your house.